1 – Number of times Jimmie Johnson has made it to the Championship 4 in the new Chase format. 2 – Number of runner-up finishes Jimmie Johnson has posted at Homestead-Miami Speedway; it also is the career best-finish Johnson has posted at HMS (2004 and 2010). 3 – Number of top-five finishes Johnson has posted during the 2016 Chase for the NASCAR Sprint Cup. 4 – Number of wins Jimmie Johnson has posted during the 2016 season; including two during the Chase for the NASCAR Sprint Cup (Atlanta Motor Speedway, Auto Club Speedway, Charlotte Motor Speedway and Martinsville Speedway). 5 – Number of top-10 finishes Jimmie Johnson has posted during the 2016 Chase for the NASCAR Sprint Cup. 6 – Number of previous NASCAR Sprint Cup titles Jimmie Johnson has won (2006-2010, 2013). 10 – Number of top-five finishes Jimmie Johnson has posted this season. 11.7 – Johnson’s average finish during the first nine races of the 2016 Chase. 14.3 – Johnson’s average finish during the 2016 season. 15 – Number of top-10 finishes Jimmie Johnson has posted this season. 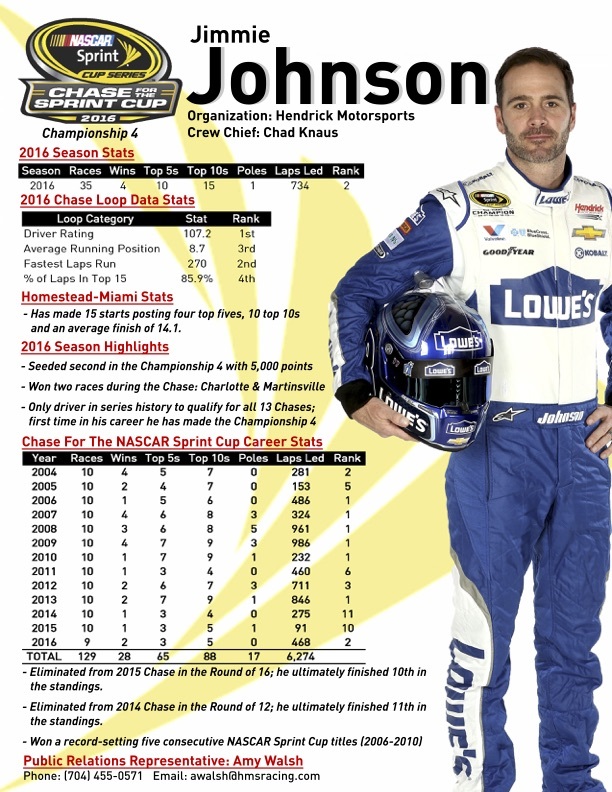 96.8 – Jimmie Johnson’s career driver rating at Homestead-Miami Speedway (second-best among the Championship 4). 99 – Total number of laps led at Homestead-Miami Speedway by Jimmie Johnson. 107.2 – Jimmie Johnson’s driver rating during the first nine races of the 2016 Chase. As the sun sets at Homestead-Miami Speedway on Sunday, Jimmie Johnson hopes to hoist the NASCAR Sprint Cup Series championship trophy a record seventh time to tie NASCAR Hall of Famers Dale Earnhardt and Richard Petty. Johnson notched five consecutive titles from 2006-10 and his most recent in 2013. If Johnson were to win the title this weekend in Miami, 10 seasons after his first championship, it would be the shortest period of time between first and seventh titles out of the three. Petty was crowned champion for the final time in 1979, 15 seasons after his first title (1964); Earnhardt captured his seventh championship in 1994, 14 seasons after his first (1980). The number seven also marks Johnson’s spot on the all-time Sprint Cup Series wins list; his 79th career victory came at Martinsville this fall and vaulted him into the Championship 4. In the first two years of the current Chase format, the champion was crowned after winning the season finale at Homestead-Miami Speedway – one of the rare tracks where Jimmie Johnson has yet to win in the NASCAR Sprint Cup Series. Of active tracks on the Sprint Cup Series schedule, only Chicago, Homestead-Miami, Kentucky and Watkins Glen have yet to host Johnson in Victory Lane. But that’s not to say it can’t be done, and prior to this Chase format, Johnson never needed a win to guaranteed a title. Johnson has posted 10 top-10 finishes in 15 races at Homestead-Miami, including four top-fives. He has captured a pair of Coors Light Pole Awards at the 1.5-mile oval and two runner-up finishes (2004, 2010), as well. Additionally, his career record at similar-length tracks is record-breaking. He has a record 26 wins across five other 1.5-mile tracks (Atlanta, Charlotte, Kansas, Las Vegas, Texas) and has 70 top-5 and 106 top-10 finishes at all active mile and a half circuits. To win a seventh championship at Homestead-Miami Speedway, Jimmie Johnson is probably going to have to break a string of three consecutive ninth-place finishes at the track, going back to his last championship in 2013. Although he was out of the hunt for the championship in 2014 and 2015 after being eliminated in the Round of 12 and Round of 16, respectively, his performances in those races would have fallen short of the title. In both 2014 and 2015, three of the four Championship 4 drivers finished ahead of him and the champion had to win the race both times. It’s not just the driver of the No. 48 Lowe’s Chevrolet who is chasing history at Homestead-Miami this weekend, crew chief Chad Knaus is looking to inch closer to the championship total of NASCAR Hall of Famer Dale Inman, who won eight. Inman captained the teams who won seven championships with “The King” Richard Petty and then followed that up by winning a title with Terry Labonte in 1984. He also tallied a record 193 wins as a crew chief. Knaus paired up with Johnson beginning with the 2002 season, when the duo won three races. He has been with Jimmie Johnson for all six of his NASCAR Sprint Cup Series championships and has recorded 77 wins as crew chief, to date. Rick Hendrick already has a prime seat reserved for the NASCAR Hall of Fame induction ceremony next January, as he will be one of five new members enshrined in the Class of 2017. But he is hoping to sit at the head table once again during the season-ending awards banquet in Las Vegas.